Marnen Mioduszewski Bordonaro Wagner & Sinnott, LLC - Attorneys - Donald F. Fessler, Jr.
Mr. Fessler is a life-long resident of Erie, Pennsylvania. He graduated from Cathedral Prep in 1980 and the University of Notre Dame in 1984 with a Bachelor of Business Administration degree in Marketing. After graduating from college, Mr. Fessler worked for Marine Bank as a Management candidate. 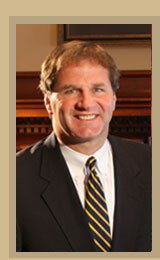 He returned to the University of Notre Dame School of Law and earned his Juris Doctor degree in 1988. In 1988, Mr. Fessler was admitted to the practice before the Pennsylvania Supreme Court. He is also admitted to practice before the United States Court of Appeals for the Third Circuit and the United States District Court for the Western District of Pennsylvania. Since his admission to the Bar, he has been representing employers, insurance carriers, and injured individuals by providing legal counsel and representation primarily in the area of workers' compensation. He was certified as a Workers' Compensation Specialist in Pennsylvania in 2013. He also practices law in general civil litigation and residential real estate. He routinely appears before workers' compensation judges throughout Northwestern Pennsylvania, the Workers' Compensation Appeal Board, and the Commonwealth Court. He has argued before the Pennsylvania Supreme Court. Attorney Fessler has made presentations on workers' compensation topics at various seminars and speaking engagements. Mr. Fessler sits on the Board of Trustees for Marquette Savings Bank. He formerly sat on the Board of Directors for the Erie County Bar Association where he served as President in 2013. He is a former chairman of the Workers' Compensation Section of the Erie County Bar Association. He is also a member of the Pennsylvania Bar Association, the Workers' Compensation Section of the Pennsylvania Bar Association, and the Pennsylvania Defense Institute. In addition to serving his clients, Mr. Fessler is an active volunteer in his community. He and his wife, Erin, were two time chairpersons for the March of Dimes Chef Auction. His is a supporter of Juvenile Diabetes, Cathedral Prep, and the University of Notre Dame. In service to his church, he is a Eucharistic Minister at Saint Peter Cathedral, where he also formerly served on Parish Council. An avid golfer, Mr. Fessler won the title of City Champion from the Erie District Golf Association in both 1995 and 1996. He has shared his love of the game by volunteering his time teaching inner city youth how to play the game of golf. He also volunteered his time as a basketball coach.